Poison frogs are chemically defended from predators by diverse alkaloids, almost all of which are sequestered unchanged from alkaloid-containing arthropods in the frog diet. Oribatid mites recently have been proposed as a major dietary source of poison frog alkaloids. Here, we report on alkaloids common to an oribatid mite and poison frogs. Gas chromatographic-mass spectrometric analysis of methanol extracts of adult Scheloribates laevigatus (Oribatida: Scheloribatidae) revealed nine alkaloids. Five of these have been detected previously in the skin glands of poison frogs: two isomers of the pumiliotoxin 291G, two isomers of the 5,6,8-trisubstituted indolizidine 209C, and the 5,6,8-trisubstituted indolizidine 195G. The other four alkaloids, a pumiliotoxin, a tricyclic (coccinelline-like), and two isomers of an izidine, were not previously known, but are similar in structure to alkaloids found in poison frogs. Alkaloids were not detected in immature S. laevigatus, suggesting that they are adult-specific and possibly the result of mite biosynthesis. Although most of the alkaloids detected in S. laevigatus are common to poison frogs, the geographic distributions of these organisms are not sympatric. 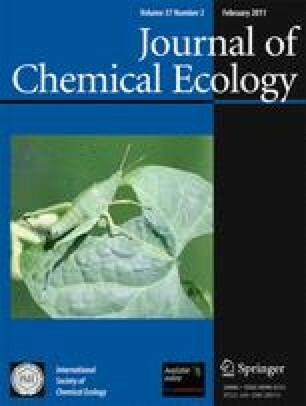 The findings of this study indicate that oribatid mites, and in particular, members of the genus Scheloribates, represent a relatively unexplored arthropod repository for alkaloids and a significant dietary source of alkaloids in poison frogs. The online version of this article (doi: 10.1007/s10886-011-9914-7) contains supplementary material, which is available to authorized users. J.M. Snyder provided comments that improved the quality of this manuscript. An NIH Courtesy Appointment and a National Science Foundation Postdoctoral Research Fellowship supported R.A.S. The research at NIH was funded by intramural funds of NIDDK.